Being about to count and calculate money is an essential life skill. 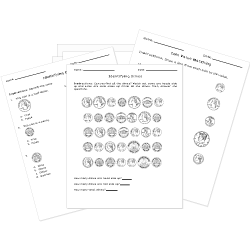 These money worksheets help students recognize coins and calculate change today, better preparing them for money management tomorrow. Don't see a printable you need? Use our Test Maker™ to create your own printable that fits your needs. Browse money questions or use our advanced search to find existing questions while filtering by grade levels and keywords.